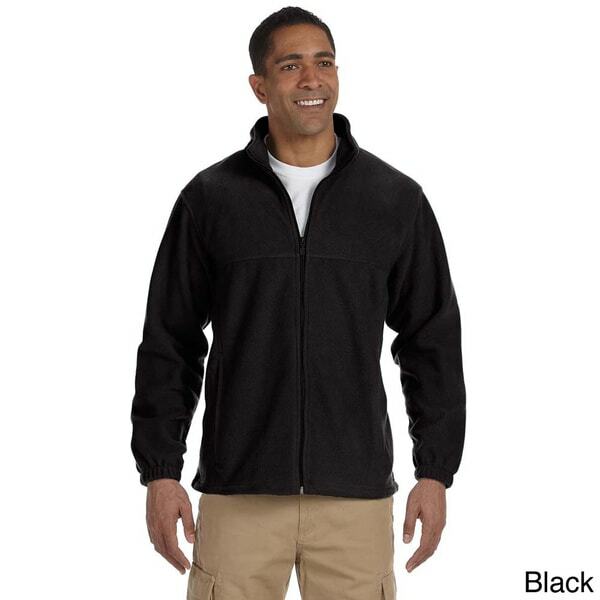 Spun polyester fleece makes up this ultra comfortable jacket for men. This mid-weigh jacket has a front yoke coupled with non-roll elastic cuffs. Nice color. True to size. Great strong zipper and Quality material. Not what I expected from Harrington. Rather flimsy material. This Jacket is very comfortable and durable!!! ive washed it a few times and it hasnt faded at all. its comperable to the more expensive couterparts. Very good buy and I highly reccomend this one! Purchased for my husband to replace an old fleece jacket of his. This is just as described and just what we wanted, not very thick or heavy, perfect to wear around the house as another layer on those chilly days. Nice jacket. I wear a medium for shoulders, but I could use a little more length in the sleeves. But, not bad at the price. The jacket's durable and comfortable. This was a Christmas gift. She has already filled it with jewelry. This is a nice fleece but I wish it had an inside or outside breast pocket to carry cell phone. Bought for nephew and he loved it. Seem to be thick enough! Delivered quickly. The fabric seems a low grade fleece. The lower portion is a bit bell-shaped and is not a slim cut as pictured. Not much shape to the entire jacket. The price point was great! "What is the weight of the fleece ? 100, 200 or ? Midweight or lightweight is relative." Hello apollo10204, thank you for your inquiry. Unfortunately, the information you have requested is currently unavailable. We will continue to try and answer this for you. You will receive an email notification once an answer is posted. Have a great day.